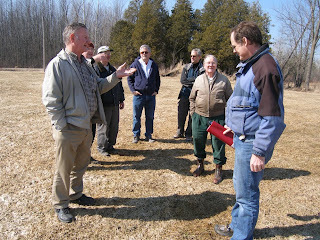 On March 15th the damn broke and a herd of restless glider pilots flooded the field. ... and some also did their spring tow checks. The weather gods are smiling on us so far, take advantage of it. Come on out and enjoy some flying. The field is dry, the tow pilots willing and the instructors eager. And as usual there are lots of people standing around to give you advice on your last landing. Our new ASK-21s are out of the box and itching to fly. Dave, Luke and John have been diligently working for weeks, in the chilly workshop installing the instruments. Eddie Hollestelle and Chris Eaves spent the day at SOSA Feb 28th doing the final inspections required for the C of A. 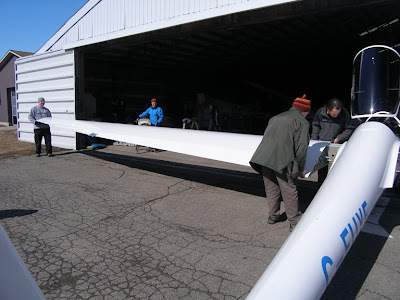 A large crew of people arrived to help rig the new members of our fleet: FUYE and FUZH. We may be able to fly FUYE and FUZH as early as April 1st if all the paperwork has arrived in the mail! Pencil it in your calendar. Ultimately the K21's position in our fleet is for student training. With this in mind the first weekend or two will be focused heavily on instructor checkouts to facilitate a speedy transition to student training. But don't worry we won't turn eager members, interested in the new toys, away. You will all get a turn. After a perfect check flight on Feb 28th with instructor Joe Stubbs, James Stang had the first Solo-Student flight of the year. The cold weather was certainly taking it's toll on the poor instrcutor who forgot to wear his long johns. 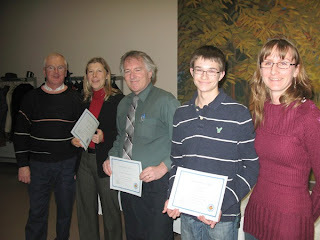 The SOSA Annual General Meeting was held February 7th this year at the Canadian Warplane Heritage Museum. 2008 was a successful year despite the damp weather. Sadly this year two of our long standing and very hardworking board members stepped down, our President and Treasurer Dave Springford and CFI John Brennan. 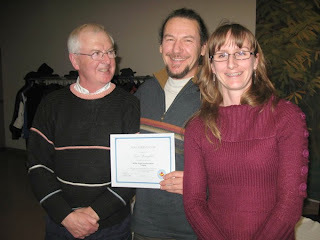 John also held the positions of President and Grounds director over his long service on the board. Our trusty Aircraft Maintenance director Al Grant also stepped down this year. We should all make an effort to thank these three and all those on the board of directors. Many hours go into running our fine flying club. 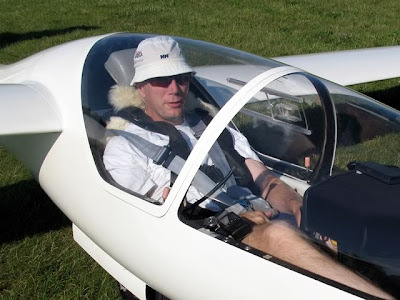 Dave Springford was awarded the SOSA Flight Achievement award for his 999 point day at the 2008 World Soaring. Newly licenced pilots Vlada Dekina, Mark Karamis and Niel Wilson receiving their certificates of acheivement from the former CFI and new President. Scott McMaster for a significant contribution by a Tow Pilot (DOUGLAS C. WINGER MEMORIAL TROPHY). Winter. Sometimes we can fly and sometimes we can't. These two pictures illustrate the extremes of the season. SOSA has been known to fly in every month of the year over its 60+ year history. It depends upon the members, the weather, and the fragility of the runways. Check in with the club's discussion group over the winter. 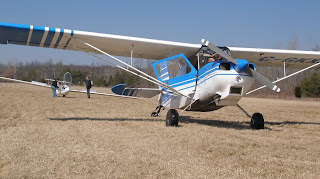 Your 2009 flying season starts after spring thaw, as soon as the runways are dry enough to use. Don't wait! SOSA took delivery of our new K-21's on Wed 7 Jan. Many thanks to Andy Mazur who allowed us to use his loading bay and occupy his warehouse from 12:30 until 7:00 pm! The gliders were secured in the container with steel frames that were screwed to the floor. Here Chris Wilson had to crawl under the glider to get to the one last screw. 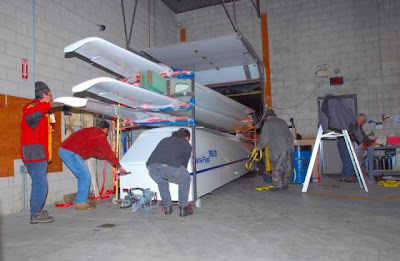 The second fuselage is being rolled out of the container with Greg Finlay steadying the tail and Adam Zeiba and Dave Springford moving the dolly into place. Chris, now out from under the glider, watches the nose for clearance. 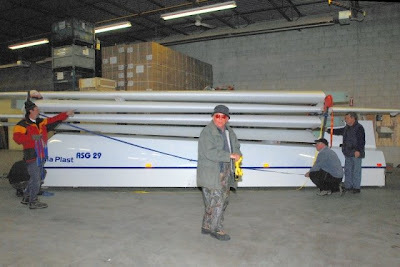 The fuselage dolly being put in place with Jerzy Szemplinski supporting the glider. Adam, Chris, Greg and Dave (hidden) manouevre the glider to line it up with the trailer. 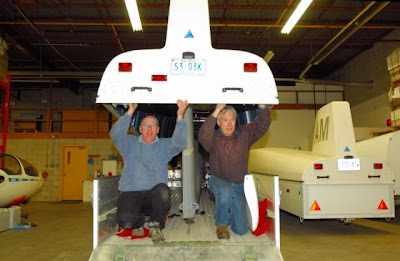 Jerzy and John Burany removing the horizontal stabilizer from the container. With the two fuselages and stabilizers out of the container, it is now time to move Jerzy's trailer and the rack holding the four wings. This was made easy by the 5 inch nylon rollers bolted to the frame under the trailer. The trailer axle had to be removed for shipping otherwise the rack was too tall for the container. A short pause to gauge the progress. Tom Coulson making his first visible appearance, but certainly not his first physical appearance on the job! Adam, Greg, Jerzy and Dave add some safety straps to the rack while John Burany is caught in the lens like a deer in the headlights. Dave and Chris remove the bolts holding the first wing to the rack, while one of our photographers, Steve and John Burany look on. Steve, of course, did more than just take pictures, adding his back to the lifting as well. While Greg, Steve and John hoist the tip. Our other photographer, Maria Szempliska caught in a rare moment on the other side of the camera, well done Steve! With Maria is Andy Mazur's spouse Jola. belonging to Greg and Chris. 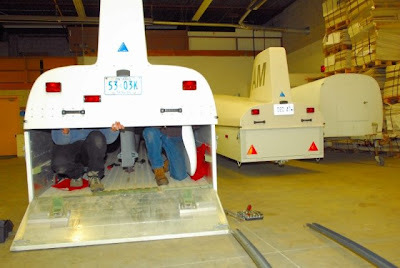 Finally, a picture of the two fuselages in the workshop at SOSA. Thanks to Luke Szczepaniak who joined us at SOSA around 8:00 pm to offload the last glider. For now, the gliders need to go through an import and conformity inspection before a C of A can be issued. The C of R paperwork is in the works. We also need to install some instruments and the radios before they are ready to go, probably some time in early April. Thanks to everyone who helped out with the unpacking and delivery to SOSA. It was a long hard day, but well worth it! 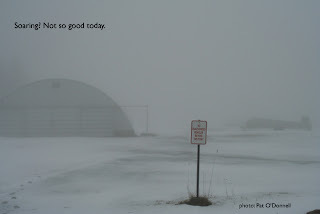 January 1, 2009 at SOSA Gliding Club, Rockton. In the Blanik are Andrew Corrigan (rear) and John Brennan. Standing are Steve Benedek, Les Waller and Ryan Maloney. All agreed that it was was a wee bit brisk. 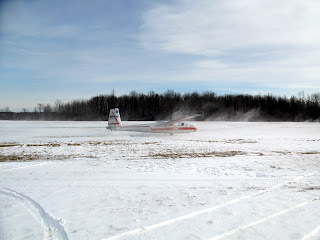 We got out two Blaniks and our Citabria tug - coincidentally, it's the towplane with cabin heat. Throughout the short daylight hours today several dozen arrived to fly and did so. Here's a Blanik, rolling behind the Citabria, plowing through the cloud of snow sprayed up by the tug. By day's end a couple of dozen had rung in 2009 with a glider flight - surely a harbinger of great flights in the coming year. Thanks to everyone who showed up with goodies to share today. Quite literally, there was everything in the clubhouse from soup to nuts after the flying. 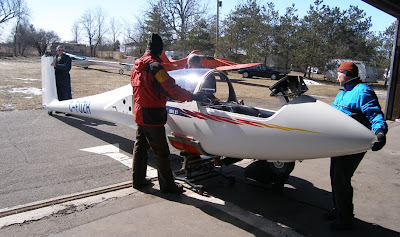 One of the top questions asked about soaring is, "Can you fly in the winter? It must be cold up there." Yes, it's a cold way to fly. 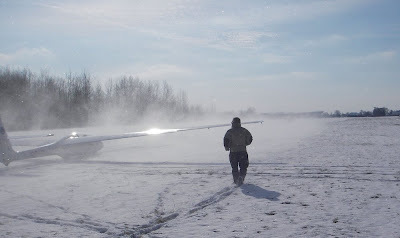 It's also a little harder to push gliders around in the snow and yes, it's absolutely the best way we can think of to look forward to the coming soaring year. 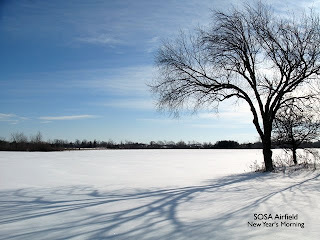 SOSA wouldn't be quite the same without its annual New Years Day version of the Polar Bear Club. The K-21's are now loaded in the container and are set to sail from Bremerhaven 18 Dec. The expected ETA in Toronto is 3 Jan! Both of our K-21's are now finished and the test flights have been completed. The gliders are currently being packed into the shipping container and will be on their way just before Christmas. We expect them to arrive in Toronto in Jan. 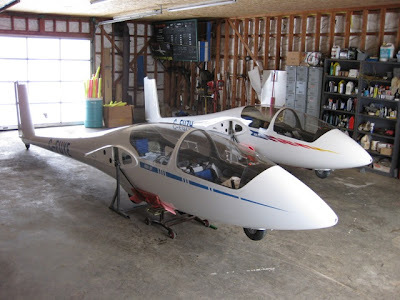 This time of year - November and December - glider pilots are not thinking about planning soaring flights. For me, the main reason to check the weather is to determine the ski conditions ... not to plan my next flight. - we had a lot of fun in the process! This all happened at the end of November ... when there was snow on the ground. On the Wednesday before the flight, I was checking the weather and I didn’t have my hopes up about flying on the weekend. The Pennsylvania Ridges - a few hours' drive south of SOSA and a favourite club hangout - weren’t going to be working and the local WX for SOSA was going to be just above zero. I assumed the runway would be too soft for a flight operation. However, Mount St. Louis had 18 ski runs open. Fortunately, Dave Springford sent out an e-mail just before the weekend saying there was going to be a flying operation on Saturday. I decided to head out to SOSA because there will be plenty of time to ski in the next few months. Dave’s e-mail prompted a lot of others to come out. So the club activity was vibrant for November. When Pat O’Donnell landed, I got a briefing on the conditions. He was up for 45 minutes and reported lift, but heavy sink in the circuit. The sky was looking good when we took off and I was getting excited about the possibilities. While Al Grant was towing us, I noticed a cloud street from St. George towards Woodstock. My first thought was to recall who at the club would be able to act as a retrieve crew. The cloud street was looking great. In the 30 km I could see, four flat, dark spots looked like they were working. I was sure we could make it to Woodstock. (Remember - this is the end of November) We released before St George and Vlada took us to the cloud street. At first, I had a really rough time assessing the lift. The audio vario in the front of the Puchacz was not in sync with my vario in the back seat. It showed the correct direction, but was wildly optimistic. Then I realized my vario was calibrated in metres per second; the audio vario infront was calibrated in knots. This wasn’t a problem because I did the conversion from m/s to knots. (multiply m/s x2) However, something was still wrong. It was good that Vlada was flying because I could spend time on this issue to figure out what was wrong. Eventually, I used the altimeter to determine the audio vario was not working correctly. It said we were going up and the altimeter said we were going down. Now it was time to change gears. Woodstock and back was not going to happen. So I settled in for a nice local soaring flight. Vlada was doing all the work and I sat back and enjoyed the flight. I might have felt guilty about making her do all the flying, but given the smile on her face I don’t think she minded. At one point we spotted a flock of gulls and they weren’t flapping their wings. Vlada was able to get 6 knots, taking us from around 3000 feet to +4000 in no time. At this point I was really amazed at the conditions. The cloud formation was nothing like I had seen before. Looking at the horizon, it appeared we were at cloud base, but the seagulls were much higher. I’m guessing one of the gulls was another 300-400’ above us, but I thought we were at base. Maybe the core was so strong that it pushed the cloud higher in the center and the edges were at a lower altitude? Eventually, we had to stop thermaling because my stomach couldn’t handle boring holes into the sky anymore. We headed east to another street. Vlada was able to connect and we flew about 5km past the tanks (to the east of SOSA). Getting back was interesting. Vlada flew back in the same street flying slowly. With the head wind, it appeared we were hovering for the longest time. It was as if the tanks were a big magnet and they wouldn’t let go of us. Finally, we made it back without the assistance of a ground crew. We travelled from SOSA to St. George, then travelled east past the tanks, and returned. The flight was a little over two hours and it was one of the 'funnest' flights I had this year. After the aircraft were packed back into the hanger, everyone headed to the club house to enjoy the warmth of the fireplace and a beer while we listened to the flying stories of the day. Now that the fall work weekend is finished and the windsock is down, you might think the flying season is over - but its not. As long as the runways are relatively clear of snow and there are people who want to fly, we can continue flying throughout the winter. On Sunday 23 Nov all of these conditions were met and out came the Puchacz and Citabria for a little bit of flying in the snow - if you have not yet tried - it is lots of fun. We even modified the gator into a 4 passenger vehicle for winter operations. The two rear seats, sitting right over the rear axle, give that little bit of additional traction in the snow when occupied. Forecast calls for sunny weather this coming weekend - see you there ? 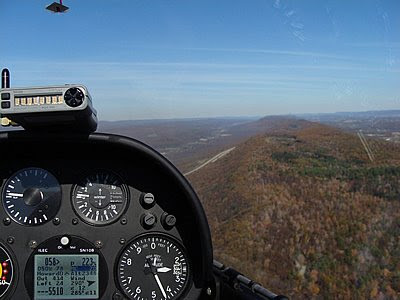 Ridge, Thermal, Rotor and Wave: Pennsylvania, USA! 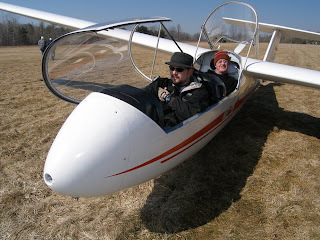 Joerg Stieber, fresh from a trip to Ridge Soaring Gliderport in Julian, Pennsylvania, sent his story and photos. 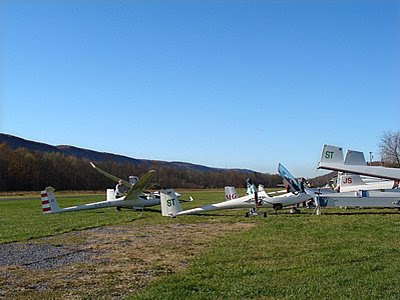 Every year in spring and fall, glider pilots from the eastern US and central Canada converge on the Ridge Soaring Gliderport in central Pennsylvania. Ususally, there is a good contingent of SOSA pilots present. Last weekend I felt I had to get away from it all, so on Sunday afternoon, Oct 26, I hitched up JS for the six hour drive to the Ridge. Monday started out as a clear thermal day with thermal averages of 4 kts to 5600. Later in the afternoon, conditions got weak as an overcast pushed in from the south, cutting off the sunlight. Tuesday was the most amazing Ridge day I have ever experienced. The sky was completely overcast with low wet cu racing across the ridges. The wind was strong and the direction was ideal. 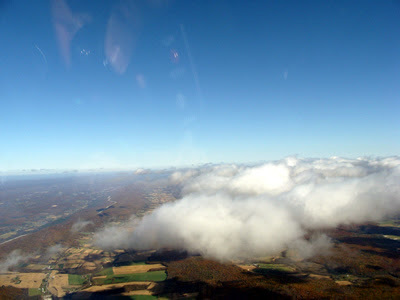 When I released from tow at the top of the Ridge I couldn't believe the turbulence. The SN-10 showed a wind speed of 43 kts at Ridgetop - no wonder! While I was trying to decide whether to land or continue flying, ridge lift and rotors carried the glider up the cloud base at 4000 ft. Further up, the turbulence was a bit more tolerable and I decided to stick it out for a few hours. The prospect of diving down into the valley to land in these conditions wasn't really appealing either. Snow and rain showers rolling in over the Allegheny Plateau made it impossible to go very far. Over Altoona I contacted wave and climbed to 6000. It was wonderful to rest in the silky smooth air of the wave. I was just high enough to take a peek over the tops of the lowest cloud layer and to see blue sky in the distance to the SW. It didn't take long until the wave window below started to close, so it was time for a full dive brake descent to get under the clouds and also back into the turbulence. The ideal wind speed for the Ridge is 25 kts. At over 40 kts the speed one can achieve is not only limited by the turbulence but also by the crab angle of 30 degrees one has to maintain in order not to get blown into the lee of the Ridge. Even with indicated airspeeds in the 80 to 90 kts range, the speed over ground was rarely above 60 kts. I landed after 4 hrs and 370 OLC (Online Contest)) km - "shaken, not stirred", to use Jerzy Szemplinski's words. On Wednesday strong and incessant lake effect (Lake Erie) snow made flying impossible. There was a heavy winterstorm warning in Clearfield on the plateau. Thursday was a beautiful day. Terry McElligott in JT had joined the Ridge Runners. Reliable ridge lift In the morning made a quick run up to Jersey Shore easy. Down in Altoona the wave worked again up to 7500 ft. As the day went on, the wind and ridge lift diminished but the thermals were plenty and reliable. Like most pilots, I landed early to pack up and make my way home. Flew three out of four days; over 12 hrs flying time and 965 km OLC. A long time member of SOSA , Al Schreiter, died on Oct 24, 2008 at Trillium Health Centre,Misissauga. My dad and I were both members of SOSA in the 70's and 80's. He was Canadian Team Manager when they went to France in 1978(?) and was a director at SOSA for many years. The family will receive visitors at the Turner and Porter Funeral Home, Hurontario St, Mississauga on Wed Oct 29 from 2-3 PM, followed by a memorial service and reception. 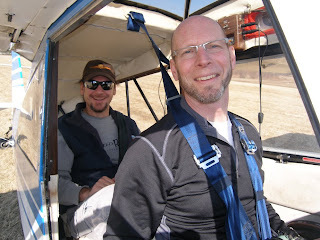 Kasper Wabinski, shown above , is one of SOSA's newest solo pilots, is the latest to get the famous First Solo Flight initiation. Igor Ratnikov, below, gets the treatment on the same weekend!